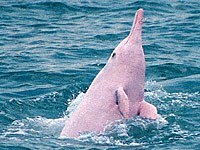 The Amazon River Dolphin, is a freshwater river dolphin endemic to the Orinoco, Amazon and Araguaia/Tocantins River systems of Brazil, Bolivia, Peru, Ecuador, Colombia and Venezuela. 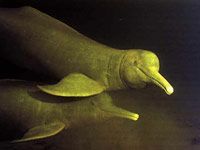 The largest of the river dolphins, whose range overlaps that of the Amazon River Dolphin but is not a trueriver dolphin. Because they are unfused, the neck vertebrae of the Amazon River Dolphin are able to turn 180 degrees. The brain of the river dolphin is 40% larger than a human brain. 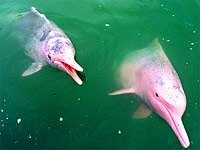 The IUCN lists various other names to describe this species including Amazon Dolphin, Boto Vermelho, Boto Cor-de-Rosa, Bouto, Inia, Pink Dolphin, Wee Quacker, PinkFreshwater Dolphin, Pink Porpoise, Tonina and Encantado. What does the Amazon River Dolphin eat? The Amazon River Dolphin has 25-30 peg-like front teeth for catching prey and it mainly eats crustaceans, crabs, turtles, catfish and other fish. The dolphins have been seen swimming thought the trees during high season. 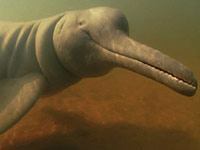 What is the mythology behind the Amazon River Dolphin? In a traditional Amazon River myth, at night an Amazon River Dolphin becomes a handsome young man who seduces girls, impregnates them, then returns to the river in the morning to become an Amazon River Dolphin again. This dolphin shapeshifter is called an encantado. It has been suggested that the myth arose partly because dolphin genitalia bear a resemblance to that of humans. 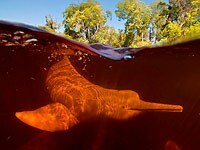 In the local area, there are also tales that it is bad luck to kill an Amazon River Dolphin. Legend also states that if a person makes eye contact with an Amazon River Dolphin, that person will have nightmares for the rest of his/her life. 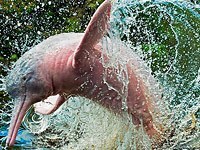 Download free Amazon River Dolphin wallpapers, click on the image to open the large version. Print free Amazon River Dolphin coloring pages, click on the image to open the large version.